Happy little penguins wishing you Christmas Joy all year long! Adorable image, Tammy, and beautifully coloured. And sweet little penguins they are, too! 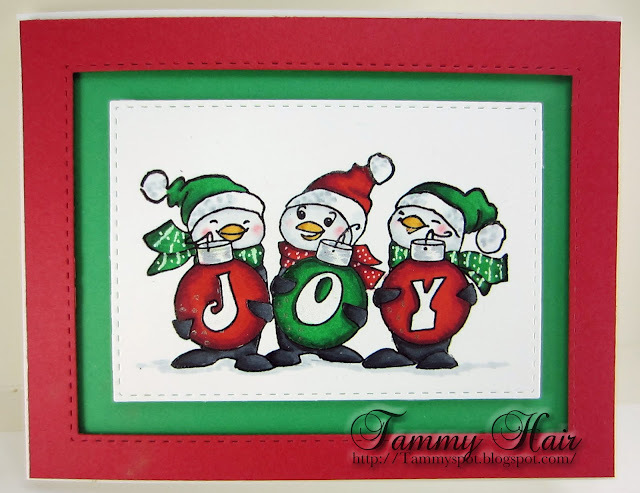 You always rock the coloring, Tammy! Clean and simple - and precious! Beautiful coloring (as always) too. They look like a happy little trio. These penguins are just adorable. I was gonna say something comically inappropriate here, regarding baubles, but TODAY, I'll act my mature and dignified age and say that those penguins are precious and that's so cute that they've spelled out JOY. Happy happy holidays to you, Tammy. I'm sure I'll wish you that at least 10 more times before it finally comes around. I feel the JOY..gorgeous colouring Tammy..
ah - these guys are so cute. Joy, indeed! I love it!